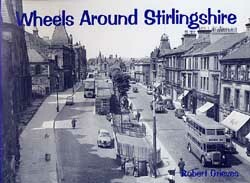 This 'Wheels' volume contains a notable collection of photographs illustrating many types of wheeled transport dating from the horse-drawn era to motorisation. Included is a nice view of the paddle steamer Princess May on Loch Lomond. Alexanders of Falkirk feature prominently as they played such a pivotal role in the development of transport across the county, although the numerous smaller operators – many of whom were ultimately absorbed by Alexanders – are captured here too. Barr's Irn Bru and McCowan's Highland Toffee are a couple of well-loved firms whose vehicles and histories are also featured. In addition to Stirling itself, locations include Falkirk, Gargunnock, Bridge of Allan, the Inversnaid Hotel, Larbert, Stenhousemuir and Balfron.